I found a metal glitter ornament and like the Christmas Ornament I made, I wanted to make a pretty heart with resin and glitter. 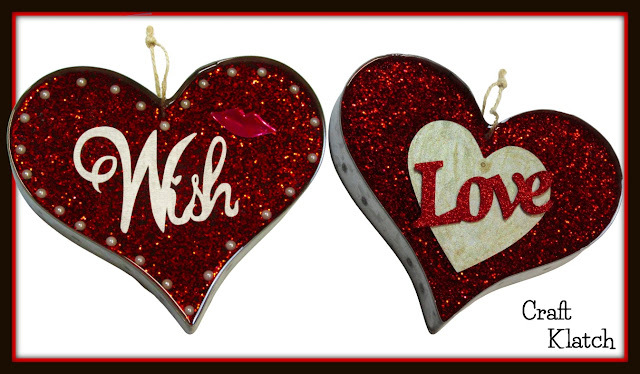 - Interesting things to put in it - I had a wood wish, metal heart and a metal Love. FX Poxy: http://amzn.to/2AF3Pkk ~ According to the manufacturer, this one is heat resistant to 500 degrees F and is UV resistant. 1. Take your Ultimate glue and run it along the inside seams of the ornament and the hole where the string comes through. Do it on the front and back side. This prevents the resin from running through. Allow to dry. 2. Mix 3-4 ounces of resin and mix in a bunch of chunky red glitter. 3. Pour into mold, pop bubbles with the lighter and allow to cure at least 12 hours. 4. Now it's time to add your embellishments. I glued on the half pearls and painted and glued on the wood wish. Allow the glue to completely dry. 5. Mix another 3-4 ounces of resin and pour over the embellishments. Pop bubbles with your lighter and allow to cure. 6. Now you want to repeat on the other side. 1. Allow the first side to completely cure. In the case of the Easy Cast, that is 72 hours. You don't want to leave any dents in the finished side by flipping it over too soon. 2. When you flip it over, it is unlikely that it will lay level. I put water bottle caps under the edges to raise it up and used a level to make sure it laid level. Now decorate the second side as you would like. That's it! Thanks for stopping by! Remember: Life's too short not to shimmer, so grab your glue gun and your glitter!™ Stay safe! Tips, Website Changes and a Coupon!